You have the power to travel back in time. How you ask? Maybe it’s the strange wristwatch that you found in an old antique shop. Or it’s the weird mobile phone application that your mad scientist grandfather developed. 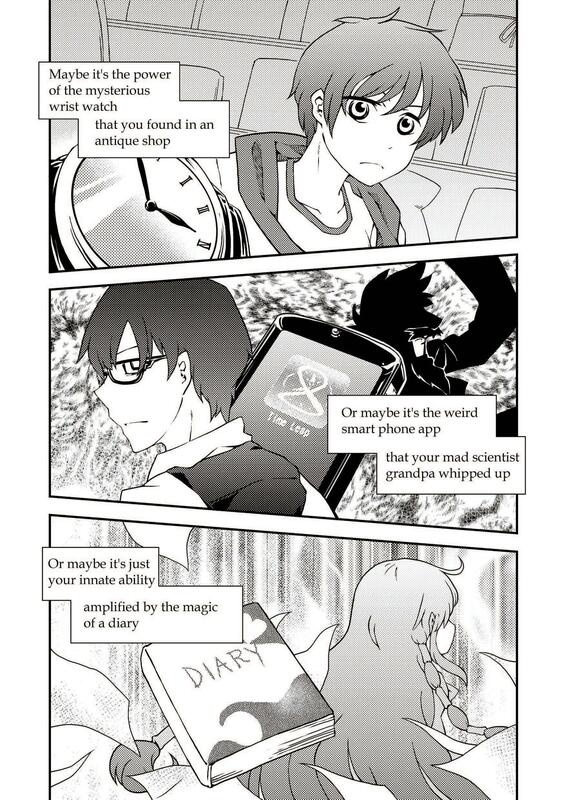 Or a magical diary. The means aren't nearly as important as the ends, that is to say, what you choose to do with this newfound power. Changing the past allows you to pursue any future you desire. Even if something bad were to happen, some awful tragedy that you simply couldn't live with. It could all be undone and the world would be right again, all in time for dinner. Your life could be perfect, or so you thought. You're not sure how it started at first, but one day everything began to change. It was so subtle at first, you almost didn't even notice when you charmed life began to slip away. Something happened that was so inconsequential, you're not even sure why you bothered trying to stop it. Perhaps you had simply become spoiled by this point. But when you went back in time to change things, somehow things turned out even worse than before! Frustrated and confused, you repeat your venture time and again, but each time something terrible happens, leading to an increasingly bleak future. You try to move past it, but the spiral of tragedy seems to be unstoppable. As you travel into the past, you begin to realize that there is more going on than you first thought. You are discover that you are not the only one who is traveling back in time. There are others, just like you, that have this unexplainable power. Also, like you, they have chosen to use this power to make the world a better place. At the same time, however, you have determined that there is another who has been pulling strings behind the scenes. Whether she is human or simply some malevolent force you cannot know, but you've seen her hand at work enough to be convinced that she exists! You have come to the conclusion that you must work together with these other Loopers if you want to have any home of escaping from this never ending cycle. Only then can you finally find true happiness. 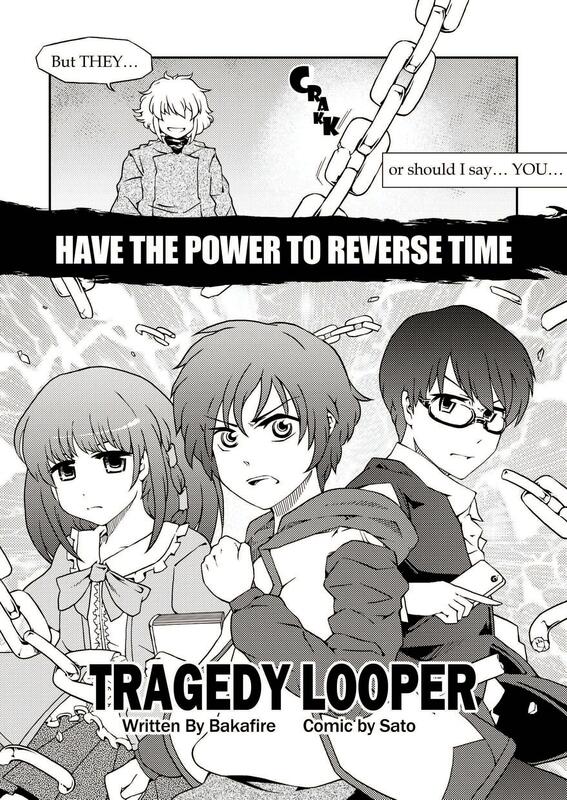 Welcome to Tragedy Looper, a time travel themed deduction game! This is my carefully crafted tutorial explaining how to play. If you have any questions when you are done, feel free to PM me! You can all travel back in time and you know that you must cooperate in order to evade the tragedy that's about to happen. Unfortunately you don’t know what will happen, who is involved or how to win or lose the game. Each time you lose, you will “loop” back in time and try again but each time you should hopefully have more information about the forces at play, the plots in motion and the incidents which need to be avoided. If you avoid losing just one single time before failing the last allowed loop, then you’ve won. Sounds easy, right? The story takes place in four locations, represented by these boards: the School, Shrine, City and Hospital. In these locations, you will find the characters involved in the tragedy. You, the players – or rather "The Protagonists" as you are known in this game - can be anywhere you want on the board and so there's no need to mark where you are. ♥♥ - Remove 1 paranoia from any other student in this location. During the game, each of the Protagonists may perform one action each day. You all have the same actions available to you and you can perform these actions influence a character or exert control over a location in an effortto avoid the tragedy. The Mastermind also has slightly different actions which she will likewise take in an effort to manipulate characters & locations in order to bring about the tragedies. The Mastermind may take three actions per day, and each much be decided secretly before the Protagonists take their actions. Protagonists won't know what actions the Mastermind is taking, but they will see what character or location the Mastermind is attempting to influence in some way. As the Mastermind's actions are not revealed until afterwards, some games may require a Moderator to confirm the Masterminds actions if her trustworthiness is in question (usually for more intense, competitive games). Each scenario contains several evil plots. In a tutorial game (First Steps) there are 3 possible main plots and 3 possible subplots in each game. They determine the loss conditions for you, which hidden Roles are active, and might add some other special rules. Of these, one main plot and one subplot are in the game. You will have to deduce which ones are active by seeing what happens in the game. For example, if you are able to deduce there is an active Serial Killer hidden role in your game, you would know that the Shadow of the Ripper subplot is active as that is the only Tragedy Plot with a Serial Killer Role. You would also know that there are no Friend or Curmudgeon hidden roles active, since there is only one subplot and they only active in the non-active subplots. If you’re playing an advanced game, there are 5 main plots and 7 subplots. In addition, there are two active subplots instead of one. Hidden Roles represent those who are related to the tragedy in some way. For example, they might be the Key Person, who triggers a Tragedy if they die, or the Brain behind some foul plot, or a Serial Killer who will inevitably kill people around him. Each character can have a maximum of ONE hidden Role. Characters which do not have a specific role are simply referred to as “Persons”. Some roles have a limit on the number of characters which can have that role in a game. For example, in advanced games where you play 2 subplots, there can never be more than 1 Conspiracy Theorist in any game. Each script normally includes one or more fated Incidents and this is the phase where they might be triggered by the culprit of the Incident. You will know which Incidents can happen and on what day they will occur BUT you don’t know who the culprit for each is. Each Incident will have exactly one culprit and it can be anyone - even one of the characters without a hidden role. These culprits are predefined and do not change from one loop to the next. 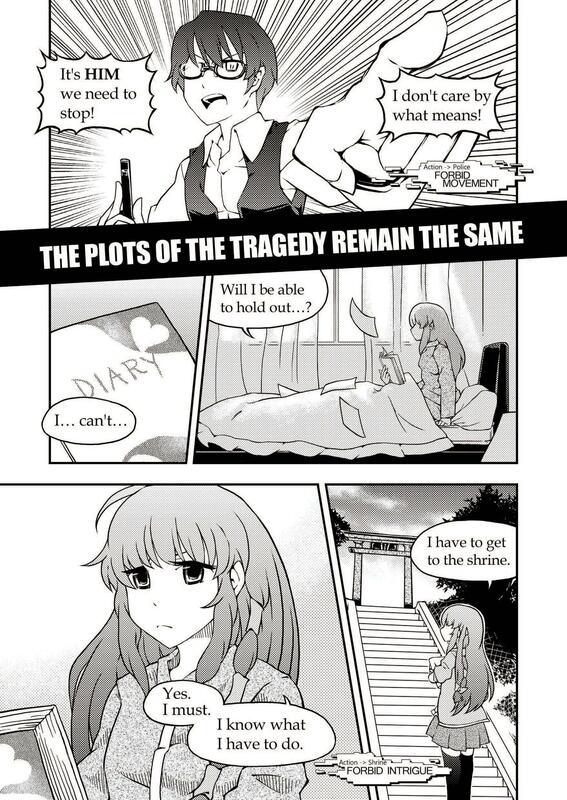 Sometimes they will be related to the plot in an obvious way, such as a character with the hidden Role Killer being the culprit for the Murder Incident, or the Key Person being the culprit of the Suicide Incident, but this is not always the case. One (1) other character in culprit's location dies ☠. Place 2 Paranoia ☹ on any character, and 1 Intrigue � on another. ♥ Goodwill: These represent how friendly the character is towards the Protagonists. Mainly only the Protagonists can place these onto characters, and if a character has enough, his/her Goodwill ♥ ability can be used. ☹ Paranoia: These represent how afraid the character is. Both Mastermind and Protagonists can place these on characters, and if they reach a certain level, the character is in panic mode and can start triggering Incidents. � Intrigue: These represent secrecy and conspiracies, on either locations or characters. Only the Mastermind can place these on characters or locations. Exactly what they do depends on the plot, but they lead towards failure for the Protagonists. ✪ Extra: These are used for a variety of purposes and will be clearly outlined in the special rules for that script. ✉ Mastermind Action: These mark what characters or locations the Mastermind is attempting to influence that day. ☠ Dead: These mark characters that have died in some way. A corpse does not count as a character for purposes of determining whether someone is alone, for example, the Serial Killer's ability. The first is that you lose because the plot rule says so. For instance, “A Place to Protect” says you lose if there are 2 or more Intrigue �� tokens on the School when the loop ends. The second is that someone you should protect dies. Look at the Key Person ability. The third is that you yourselves are killed. Some roles have this ability, for example, the Killer. When you lose, you will only be told that you have lost - not why you lost. You will have to deduce the why for yourselves. The only exception to this rule is that if you lose by being killed, then you will know that you were killed (but again, not why). When you lose a loop, the board is reset to its starting state and the loop counter is moved down. All acquired tokens on the board are also removed. The mastermind will not necessarily perform the same actions on each loop however the scenario plots, loss conditions, hidden roles and incident culprits will be the same on every loop. In advanced games, even if you lose every loop you will also get a Final Guess. After the last loop finishes, you will be asked to identify the role of each character. If you correctly identify all roles, then you have also won. In the Tutorial games, this would be too easy, so there is no Final Guess. Each round is referred to as a day. Each day consists of 5 phases. 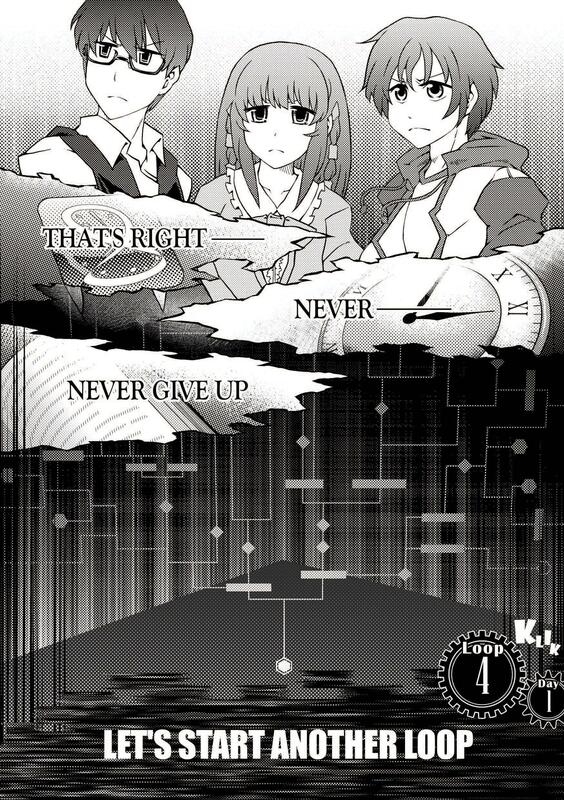 At the start of the game one Protagonist will be designated the Leader. The Leader is the one who decides which Goodwill ♥ abilities to use. The Leader changes at the end of each day. Some special things might happen at the start of the day (based on plots or roles). If anything transpires during this phase, the Mastermind will inform you. The Protagonists take no action during this phase. In this phase the Mastermind begins by marking three characters or locations where they wish to perform an action. In the example above, the Mastermind attempted to influence the Shrine Maiden, the Boy Student and the Police Officer. The Mastermind can only perform one action with each character or location. 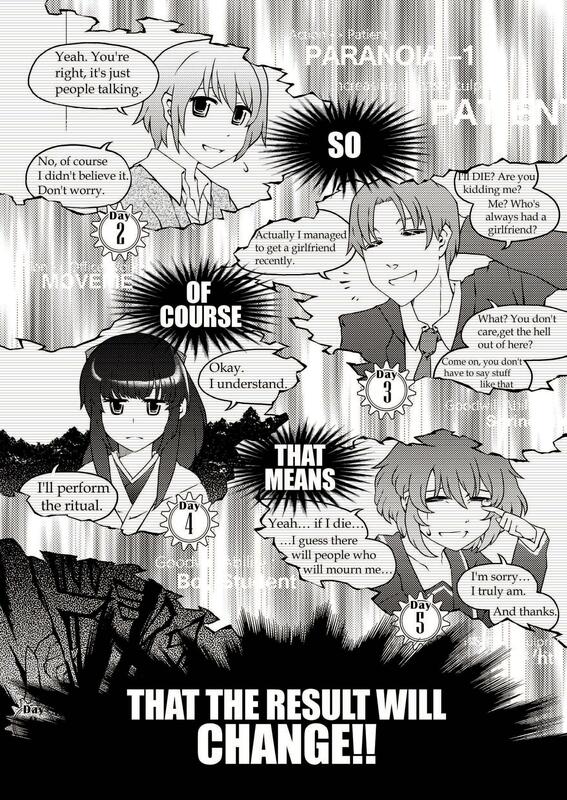 Next, the Protagonists can discuss what they think they should do and when they are ready, they may perform one action. They should announce their intentions using bolded and red text words, just to be sure it stands out. This can be done in a thematic manner, for example: I tell Sakura that no matter what, she should not leave the shrine, under any circumstances; it's a matter of life or death. So long as it is clear which character or location you wish to interact with and what effect you hope to have. Protagonists may take action with a character or location where the Mastermind has performed an action; however, they may NOT take action where another player has already taken their action. In other words there’s a limit of one Protagonist action per character or location. In more advanced games where discussion between players during the day are forbidden, Protagonists should PM their actions to the Mastermind and only declare which character or location they are playing on. When you're first starting out don't worry too much about which action you take the first loop as you will have very little information to go on. It's more important to take note of which action the Mastermind is taking and where/on who. Fostering Goodwill ♥ is always a good idea, especially if you can't think of anything else to do that day. Once both Masterminds and Protagonists have declared their actions, we move on to the reveal and resolution step. Most actions can be performed as many times as as the Protagonists and Mastermind wish. However, some powerful actions can only be taken once per loop by each player. These actions are marked with a <only once per loop> designation. (for instance, the Goodwill ♥♥ +2 action). These actions are not available to you until the loop resets. Now we'll go through a few different action combinations so that you can see how they get resolved. Some actions have “forbid” something in the name. They happen first. For example, if the Mastermind tries to move a character, but a Protagonist uses Forbid Movement, it won’t move. Protagonists also have an Forbid Intrigue � action; the Mastermind only has a Forbid Goodwill ♥ and a Forbid Paranoia action ☹. The Forbid Intrigue � actionss are a bit special because they're so strong: only one of the Protagonists may perform one on the same day. If two or more Protagonists accidentally perform Forbid Intrigue � on the same day they cancel each other out regardless of where they were performed. Both sides can also perform actions on locations. However, the only thing that can happen to a location is that it gets Intrigue � tokens. The Mastermind CAN perform actions other than Intrigue on locations, but nothing will happen, so the only reason for her to do so is to bluff. The Protagonists have no reason to bluff, so the only action they would perform on a location is “Forbid Intrigue �”. However, remember what I said about performing more than one Forbid Intrigue � on the same day: they cancel each other out. the Office Worker can’t go to the School. the Patient can't leave the hospital. If one character gets two movement actions, they merge together into one single movement. For example: (↓ + ← = ↙). However, the Shrine Maiden isn’t allowed in the City, so this movement is cancelled out completely, and she stays where she is. If we both play a vertical movement action or we both play a horizontal movement action, they do NOT cancel each other out. The Mastermind also has a diagonal movement action (which is playable once per loop). Like the other movement actions, this resolves into a single movement when combined with a Protagonist Movement action. (↗ + ↑ = →) This action combination would resolve to a single horizontal move, and if these were both performed on the Officer Worker it would be considered an illegal location (since the Officer Worker can't move into the school) and so it is ignored. As you just saw, I won’t say why this happened or where this Paranoia token came from. But where do think the Paranoia ☹ token came from? Reference the Roles section if you're not sure. In this particular situation, the Conspiracy Theorist, is the only role with an ability that allows the Mastermind to place a Paranoia ☹ token during the Abilities phase. But who is the Conspiracy Theorist, then? Which characters could possibly be this role? When the Mastermind is done using abilities, the Protagonists have an opportunity to use the characters’ “Goodwill” abilities. Story-wise, the Protagonists first need to establish sufficient Goodwill & rapport with a character before they are able to convince them to use their abilities. In game terms, to use a character's Goodwill ability, the character needs to have at least as many Goodwill tokens as listed in the character summary. The Leader is the one who decides which Goodwill abilities to use. ♥♥♥ - +1 Goodwill on character in same location. Can only be used while in the School or the City. Let's assume that the Rich Man’s Daughter has 3 Goodwill. Now take a look at her summary and see if her Goodwill ability can be used. It can, right? So if the Leader wishes he can post The Rich Man’s Daughter’s uses her ability on the Girl Student which would place a Goodwill token on the Girl Student. Using an ability doesn’t remove the Goodwill tokens so don't hold back! Keep in mind, however, you can only use each power once per day. Now if the Girl Student already had a Goodwill token on her, this would give her a total of two which would in turn allow her to use her ability that same day (even though she just reached 2 Goodwill). Now if you were to ask her to use her ability and she refused, for example: You try, but she doesn’t listen to you. Some hidden roles, such as the Killer and the Brain, allow the Mastermind to refuse the usage of Goodwill abilities. Some other roles, like the Cultist, force the Mastermind to refuse. Both are noted on the Role summary sheet above. So this will lead you to the knowledge that the Girl Student has a Role that has either optional or mandatory refusal. Each script normally includes one or more fated Incidents and this is the phase where they might be triggered by the culprit of the Incident. We'll now do an example Incident. Let's assume that there is a Murder Incident scheduled for this day. I would say, "You know a murder will happen today. And it happens: the Rich Man’s Daughter is killed". A death token ☠ is added to her to reflect her demise. The Boy Student, because he is the only one who is at his Paranoia limit. 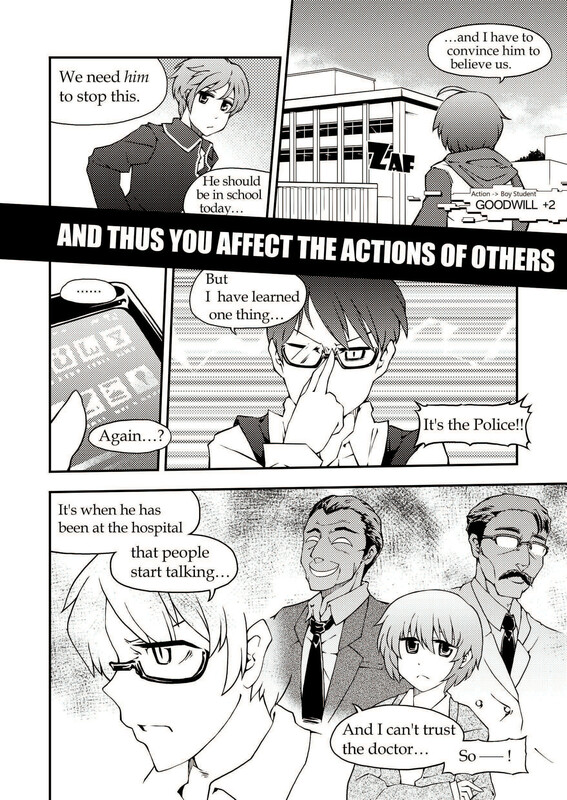 If another character, say the Police Officer, was at his Paranoia limit as well, you would still know it was the Boy Student because the Murder Incident states that they have to be in the same location. So as long as the Incident's defined culprit is at his Paranoia limit, you will know that he at least attempted to carry out the Incident, even if there is no valid targets. One other point to remember when deducing culprits is that no character may be the culprit of more than one Incident. Lastly remember that Incidents are completely independent to roles and plots. Triggering an Incident - even one which results in the death of a character - will not in itself cause the loop to restart; however, the death of a crucial hidden role or the resulting placement of Intrigue � could. When we have played as many days as the script allows, that’s the end of one “loop”. The loop might end prematurely, for example if you die. When this happens the board is reset to the starting setup, all acquired tokens are removed and the day token is reset. 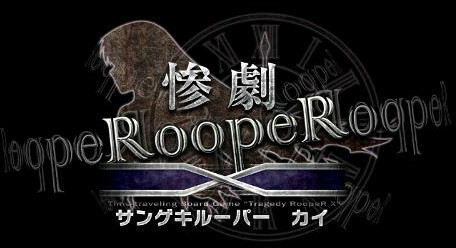 The tragedy script tells us both the number of days in a loop and the maximum number of loops in the game. The Protagonists win if they make it to the end of the last day in any loop. The Mastermind wins if the Protagonists lose on all loops (and you fail the Final Guess in more advanced scenarios). One thing to understand on the Summary Sheet is that "[Loss condition: loop end]" means that the Protagonists will lose the loop at the end of the last day, not at the end of the day that the condition is fulfilled. This means that at the end of the loop is it possible to achieve more than one loss condition, which makes it difficult to figure out how you lost and therefore what Plot you are dealing with. Even if you are convinced that you've lost a loop, take the opportunity to gather as much information as possible. It is all but impossible to win the first loop due to the significant lack of information. If you've already achieve a loss condition, such as 2 Intrigue �� in the School (Light of the Avenger), try to avoid fulfilling addition loss conditions that will make it difficult to verify how you lost. Most importantly, try not to lose the same way twice! The answers are right in front of your eyes! When we start playing it may initially seem that my Mastermind actions & the loop restarts are made up on the fly or using hidden rules. On the contrary, EVERYTHING that happens in the game - including all the Mastermind's actions and abilities as well as the Protagonists loop loss conditions - is clearly listed on the summary sheet. Of course this is a deduction game, so it's not obvious, but it is all fixed and right there in front of your eyes. 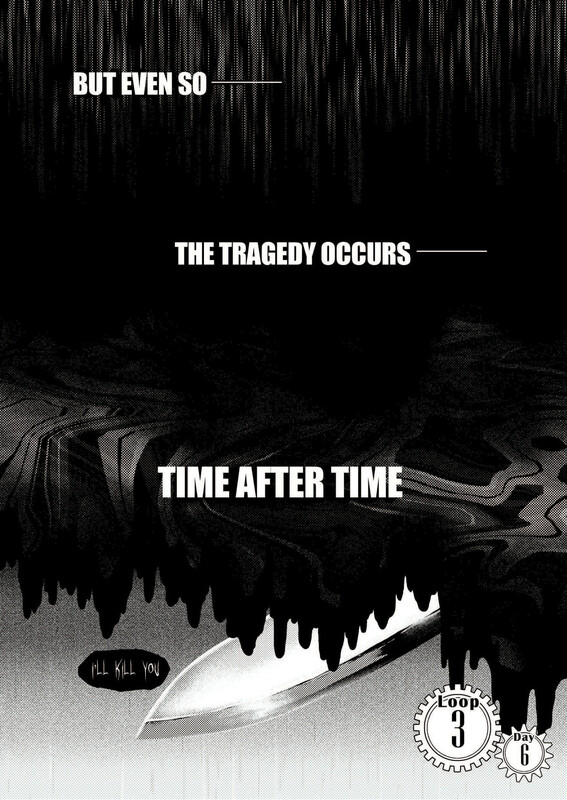 In fact, the ONLY hidden information in the game are the tragedy's active plots, the hidden role of each character and the required culprit for each Incident. Each tragedy script dictates this information. It is unfortunate that even the most evil Masterminds must still work within the boundaries of time; however, this will only make the inevitable conclusion of this tragedy all the sweeter. 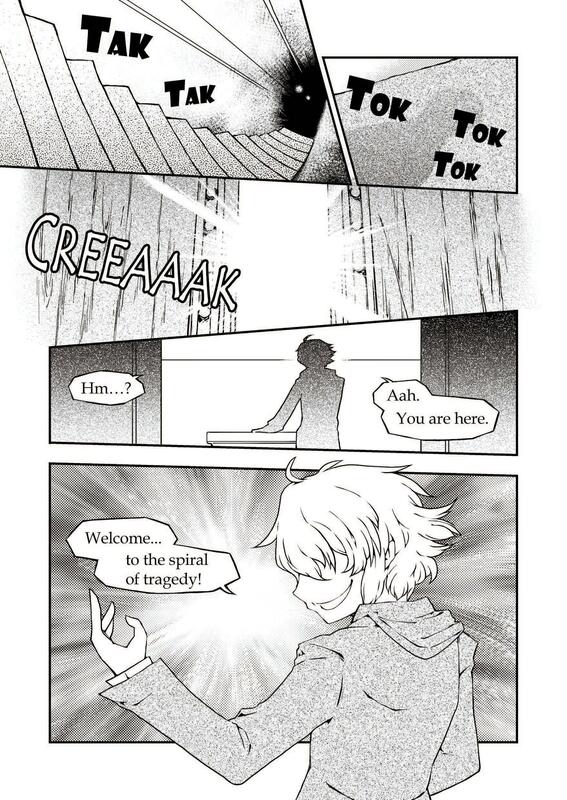 Let the Spiral of Tragedy Begin! Last edited by Trine; March 26th, 2017 at 11:21 PM. Our first tutorial game has been completed and is now viewable for reference here! Last edited by Trine; March 23rd, 2017 at 09:15 AM. The following covers some rules that many miss or misunderstand when reading the rules. Make sure you are aware of them. Click the spoilers for more info if you don't know what the main point means. The Protagonists can only perform one action per character/location per day. 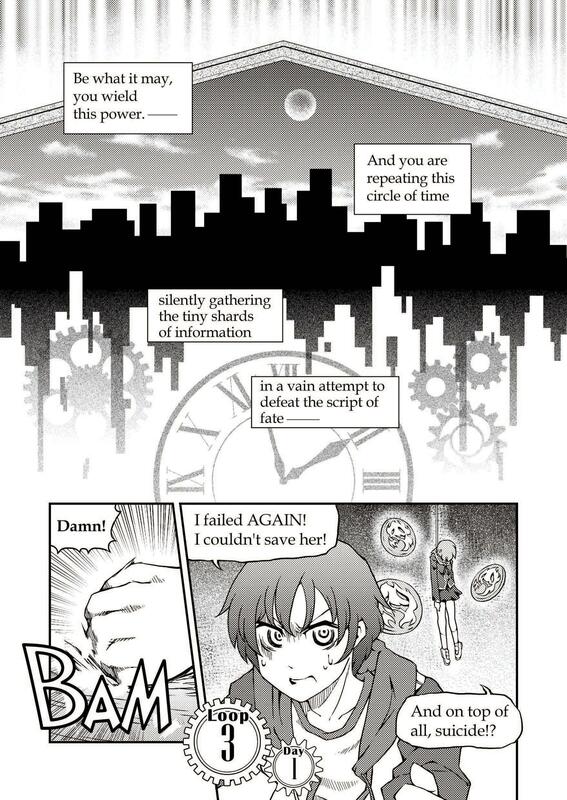 Although the Protagonists can perform an action where the Mastermind performed an action, they cannot perform a action where a previous Protagonist performed one on the same day. The Mastermind has one set of actions; each Protagonist has their set of actions. The Mastermind has one set of actions and the only action she can perform twice in one day is '+1 Paranoia'. Protagonists each have their own set of actions, so the Protagonists are able to play the same action on two different characters in the same day. Once per loop actions are only locked out for that action and that player. Each Protagonist is able to use each of their once per loop actions once for each loop. E.g., on Day 1, Protagonist A could perform 'Forbid Movement'; on Day 2, it's valid for Protagonist A to perform '-1 Paranoia' and for both Protagonists B and C to perform 'Forbid Movement'. The only actions that have any effect on locations are +1 Intrigue, +2 Intrigue and Forbid Intrigue. Any other actions performed at a location are ignored during resolution. Forbid Intrigue on a location only affects the location itself. Characters in that location can still gain Intrigue via actions played on them. If two or more Forbid Intrigues are performed by Protagonists on the same day, they are all ignored. With Table Talk On, you can avoid this very easily. Don't forget it, though. Forbid actions only stop the other action they are performed against, they do not stop role abilities and so on. For example, a Brain can still add Intrigue to a location they are in, even if the Protagonists performed Forbid Intrigue there this turn. Some characters have forbidden locations. In the First Script, this will be the Office Worker (can't enter School) and the Shrine Maiden (can't enter City). If movement actions (after combining if both the Mastermind and Protagonists performed one) would resolve to send a character to a forbidden location, they instead stay in the same place. Even if characters die, you can still win the loop. Only certain Roles have loss conditions tied to them. 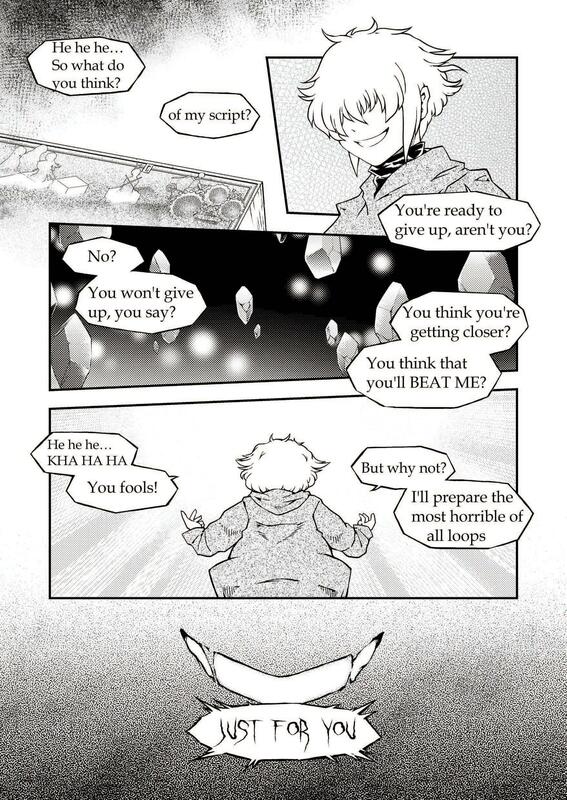 In the First Steps set, only the death of the Friend or the Key Person will result in a loss. The Key Person ends the loop immediately, while the Friend won't trigger the loss until the end of the loop. Any other character dying is fine. Keep in mind that there may be other ways to lose the loop, such as Killing the Protagonists, or any loss condition determined by the Plot, Subplot or Roles in play. You do not need to prevent all Incidents to win a loop. Although they often will, Incidents don't necessarily trigger a loss for the Protagonists. The loss conditions are determined by the Plots, Subplots and Roles in play and an Incident will only make you lose the loop if it causes one of the loss conditions to trigger. Incidents only happen on the day they are scheduled for and can only by committed by the preassigned Culprit. "The ____ Incident did not happen" - This means the Culprit is either dead, or does not have enough Paranoia to exceed their Panic threshold. 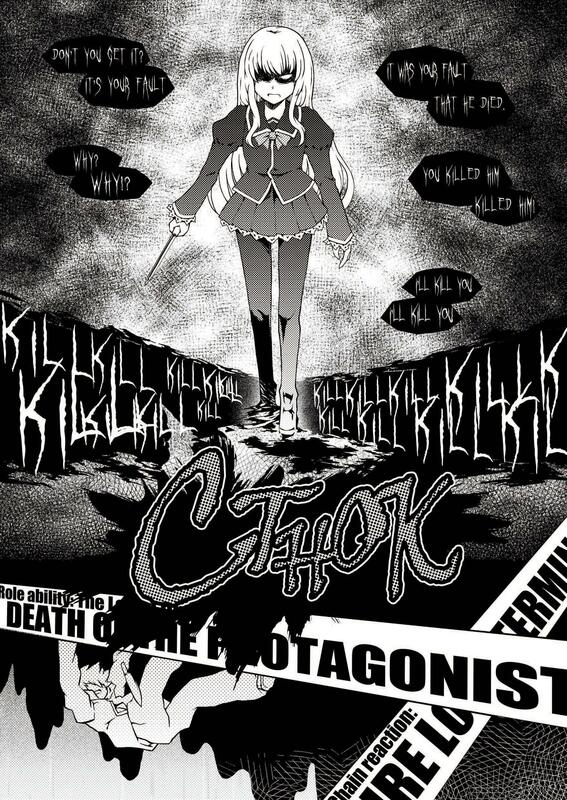 "The ____ Incident almost happened, but didn't for some reason" - This means the Culprit is alive and has enough Paranoia to be Panicked, but they cannot complete their task for some reason (e.g., there is nobody for that character to Murder if it is the Murder incident). You will not be told the reason, but it may be obvious. "The ____ Incident happened and ____." - This means the Culprit is alive and Panicked and they are able to do their task. The Mastermind will implement this task. A character can only be the Culprit of one Incident. Each Incident has a single Culprit and no character can be the Culprit of two or more different Incidents in the same Script. A character can have a Plot/Subplot role and also be the Culprit of an Incident. Each character has a single Role. Each character can also only be the Culprit of a single Incident. Any given character could have a role and also be a Culprit, though. If you are playing a First Steps script, you get no Final Guess. Of the scripts which come with the game, this covers #1 and #2. In order to win these scripts, you must safely reach the end of a loop without triggering a loss condition. Paranoia is used to trigger Incidents. Intrigue is used to trigger Roles/Plots. Goodwill is used to trigger Goodwill abilities. They aren't usually used for other things. There are only a few exceptions, for example, the Hospital Incident and Faraway Murder Incident also require some Intrigue to work. Last edited by Trine; March 23rd, 2017 at 09:20 AM. Last edited by Trine; March 27th, 2017 at 05:23 PM. Paranoia –1: Remove 1 Paranoia ☹ counter from this character. If together with a Forbid Paranoia ☹, the Forbid takes precedence and nothing happens. If together with a Paranoia +1, the +1 goes first. Placed on a location, nothing happens. Goodwill ♥♥ +2: Place 2 Goodwill ♥♥ tokens on this character. If together with a Forbid Goodwill ♥, the Forbid takes precedence and nothing happens. Placed on a location, nothing happens. Forbid Movement: If together with a Movement action, the Forbid takes precedence and nothing happens. Intrigue �� +2: Place 2 Intrigue �� tokens on this character or location. If together with a Forbid Intrigue action, and only one Forbid Intrigue � action is played this day, the Forbid takes precedence and nothing happens. Most actions can be performed as many times as as the Protagonists and Mastermind wish. However, some powerful actions can only be taken once per loop by each player. These actions are marked with a designation. (for instance, the Goodwill ♥♥ +2 action). These actions are not available to you until the loop resets. That's sooo complex... Why don't you play Mafia instead? By the way, you should come check this, Hybrid! I haven't run a game in awhile because it become impossible to form a reliable group of three.